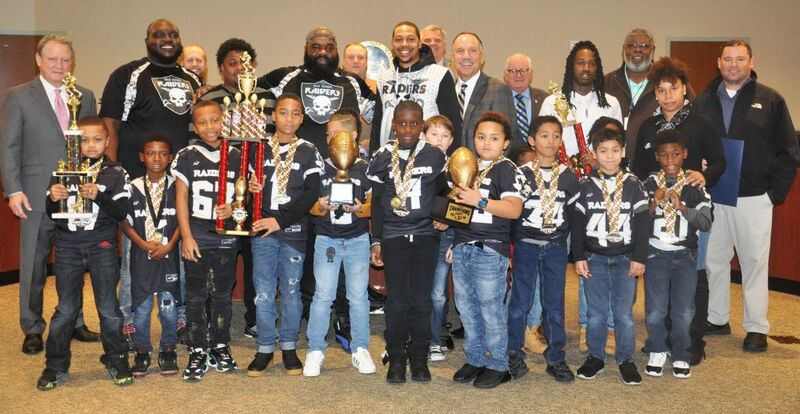 Pax River Raiders Youth Football League Inc.
We would like to welcome all participants and parents to the 2019 football and cheerleading season. We hope that this season will be exciting and rewarding for all of those that are involved. The Pax River Raiders continue to build a strong tradition for excellence and success. Our goal is to teach the fundamentals of football and cheerleading, the importance of teamwork, and most of all to have fun. The coaches will stress self-discipline, concentration, friendship, leadership, and good sportsmanship. Safety is our primary concern. Many of the exercises, drills and team rules are there to ensure your player is physically and mentally fit for football and cheerleading. Each player is unique and will develop at their own pace. We hope that this season will help develop new skills and confidence for each player who participates in our football or cheer programs. The goal of the Pax River Raider programs develop and promote the ideals of responsibility, hard work, sportsmanship, teamwork and fellowship within a safe and positive environment. The individual growth of our community's children is enhanced through the spirit of competition, discipline and fair play. These goals will be accomplished by providing a structured program designed to educate both participants and parents in all aspects of football. The Pax River Raiders are committed to providing a program that maintains the highest standards and guarantees a fun, positive experience for everyone involved. The Pax River Raiders youth football and cheer programs support the critical role that academics play in the development of our student athletes. We recognize the need to perform in the classroom as well as on the field. It is never the desire for our programs to take precedence over school requirements. If a conflict should arise, please notify your coach immediately. We would ask that parents support this effort in order to encourage academic success for every player.